The influences from the glacier plateau along with the large variety in altitudes over such short distance creates substantial variations in local climate. Jostedalsbreen is nearly 60km long and over half of the National Park is glaciated. The glaciers (fed by the excess snow from Winter) have shaped the landscape, creating lakes, U-shaped valleys, moraine fields, clean scoured mountainsides, scree slopes and canyons, and is contantly changing even today. The area is also known for the glistening streams, rivers and waterfalls. Jostedalsbreeen is a glacier plateau with many arms (or valley glaciers) descending from the plateau (cirka 2,000m over sea-level) down to a little over 300m ASL. The National value of this area is seen in the combination of nature conservation along with outdoor recreation in one of the largest such areas in Southern Norway. The cultural landscape with farms, birch gardens & mountain huts shows that Man has lived in harmony with nature "under the glacier" far back in History. Agriculture is still alive in the areas around the National Park, although many of the mountain huts/summer farms have given way to modern farming. The lowlands alternating lush deciduous forest with elm, linden and other heat-requiring plants envelope the area, whereas at 1500 m altitude alternating alpine vegetation exists with buttercups and creeping azalea as examples. Earlier Jostedalsbreen was a highway for folks from the West Coast valleys and Fjords to inner Sognefjord and the East of Norway. Cows and horses were led over the glacier for sale at the markets in Eastern Norway. Today it would be difficult to imagine the glacier as any kind of path for animals as it melts away and larger and larger crevasses open around the steeper areas. 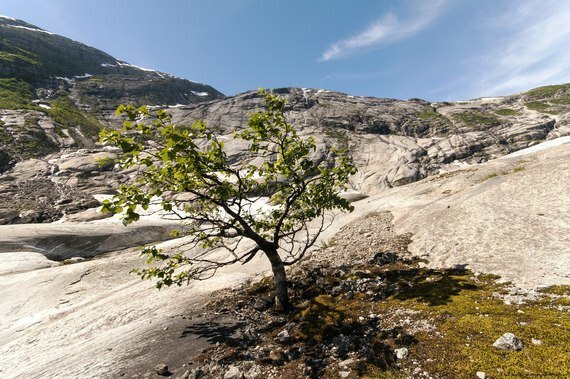 Recent research suggests that Jostedalsbreen was completely gone approximately 5-8,000 years ago. The glacier has since reached a new maximum during the "Little Ice-Age" period which lasted until approximately 1750. Inn many places farms were overrun by the advance of the glacier: Brenndalsbreen actually calved and sent ice down into a farm Tungøyane in Oldedalen while Nigards farm was taken by Nigardsbreen during the advance of that time.